When this cylinder was discovered in 1879, amid the ruins of Babylon, it made huge headlines in the Christian West. It was the first time a biblical story had been confirmed through archaeology. But the euphoria didn�t last long. The West was at the height of its democratic age and had no room for a celebrated monarch. Before the age of democracy, most of the world had been ruled by monarchs. Since good monarchs were few and far between, Cyrus came to symbolize everything a good king should be, through two of the West�s most popular books: The Old Testament and, in more intellectual circles, the Cyropaedia, which literally means the Education of Cyrus, written by the 4th century BCE Greek author Xenophon. By 1960, Herodotus� 300 Spartans had replaced Cyrus as champions of western polity transforming Persia from hero to villain virtually overnight. A century later, an earnest search for the truth is a noble and worthy cause. But there�s little truth to be found in Spiegel�s article. The sheer number of mistakes, assumptions and half truths leave one wondering whether any attempt at objective reporting had been made. It may come as a shock to people who have come to trust reputable news organizations like Spiegel to learn that not a single word in this statement is true. We know it�s not true because there are only a finite number of sources to draw from. In fact, all of our data on Cyrus The Great come from two primary sources, the Cyrus Cylinder and the Nabonidus Chronicle and four secondary, less reliable sources including the Old Testament and three classical Greek authors namely Herodotus, Xenophon and Ctesias. Not one of these sources mentions anything about Cyrus cutting off someone�s nose or ears, nor do they mention him burying anyone up to their heads in sand. But how could Spiegel have gotten it so wrong? His second war was started by the Lydian king, Croesus, who, according to Herodotus, wanted to punish Cyrus for defeating Astyages. Some of Mr. Schulz�s charges sound almost desperate. One of his �experts� complains that Cyrus, �demanded that his subjects kiss his feet.� This is yet another half truth. Yes, there is evidence that Cyrus�s subjects kissed his feet, but there is no evidence that he �demanded� anyone to do so. In fact, Xenophon describes one of Cyrus�s Generals, Tigranes, as choosing not to kiss his hands, let alone his feet. while my extensive troops marched peacefully through Babylon. In the whole land of Sumer and Akkad I did not allow any troublemaker to arise. His city of Babylon and all his cult-centres I maintained in prosperity. Mr. Schultz, on the other hand, accuses Cyrus of �deporting� urban elites. The falsehoods in this article are so numerous that citing the evidence seems futile. But then, Mr. Schulz isn�t really interested in the facts. He and his motley crew of �experts� have dismissed all these sources as �propaganda.� So what is the basis for his theory? The answer lies in a single verse of the Nabonidus Chronicle. In Tishri, when Cyrus did battle with the army of Akkad at Opis, on the [bank] of the Tigris, the soldiers of Akkad withdrew. He (Cyrus) took plunder and defeated the soldiers (of Akkad). Cyrus did not �slaughter the people,� he �defeated the soldiers.� Two words can change history, which is why it�s so incumbent on Spiegel to get the facts straight before setting out to revise it. This revelation reduces Mr. Schulz�s article to little more than speculation and conjecture. Mr. Schulz may see himself as an iconoclast out to �debunk� a long-standing tradition. But it is, in fact, Mr. Schultz�s position that is clich�. Persia�s role as an evil villain has become such an integral part of Western folklore that only a handful of books such as Gore Vidal�s �Creation� have dared challenge the Herodotian convention in the West. Whether such tolerance was intended to prevent revolts or whether it was part of their Zoroastrian culture is a matter of debate. But there is no debate over whether such freedoms existed. These rights were first laid out by Persia�s patriarch, Cyrus The Great, and the clay cylinder, which Mr. Schulz calls �a hoax,� is a rare snapshot of Cyrus bestowing these very rights on the people of Babylon after conquering it in 539 BCE. Among those who were relieved from their exhaustion and servitude were over 100,000 Jews who chronicled the events which led to their captivity in the Old Testament. They describe a horrifying scene of destruction, murder and torture carried out by the infamous Babylonian king, Nebuchadnezzar, on the Jewish people and their capital city, Jerusalem. �Nebuchadnezzar took those (Jews) who weren�t executed to Babylon to be slaves for him and his sons. They remained captives until the Persian empire began to rule . . . The lord moved the heart of Cyrus, king of Persia to make a proclamation throughout his realm and to put in writing. . . . This is what King Cyrus of Persia says: . . . May the Lord be with all of you who are his people. You may go. Here we have two completely disparate sources corroborating each other. Is this all propaganda? No previous victor seems to have found it necessary to ingratiate himself to his vanquished subjects. In fact, reigning through terror had sustained the Assyrian empire for over half a millennium. Sustaining his empire through a strategy of peace and tolerance was an enormous risk to Cyrus. Yet despite the risks, freedom of religion, freedom from servitude and the right to live where one chooses were guaranteed for the first time in writing. They may not be as well defined as the U.S. Bill Of Rights or the Magna Carta, but after six centuries of Assyrian and Babylonian rule, the decrees enshrined on this cylinder were no less groundbreaking. Cyrus influenced heads of state as recently as 1948 when President Harry Truman based his decision to support the state of Israel in large part on his reading of Cyrus. When introduced once as �the man who helped create the state of Israel,� Truman is said to have quipped, �What do you mean �helped create�? I am Cyrus! I am Cyrus! By publishing Mr. Schulz�s article, Spiegel Magazine showed a flagrant disregard for the basic standards of responsible journalism. Spiegel owes its readers truth in reporting. Instead it passed off an uninformed opinion as news. The truth is owed a retraction or at the very least an impartial follow-up article based on evidence and qualified experts. Mr. Schulz�s article closes with the following proverb: �A fool may throw a stone into a well which a hundred wise men cannot pull out.� But it seems the only one throwing stones, is Mr. Schulz. Free Iran Activists Are Asking To Boycott SPIEGEL Magazine By Public & Germans FOR Insulting Cyrus The Great, UN, Iranians, Germans, Greek, Jews, Iranian-Americans and Indirectly CALLING THE BIBLE THE BOOK OF LIES �. 3) Put Cyrus The Great painting on the Cover Page of SPIEGEL Magazine. 4) Retraction by SPIEGEL Magazine for lies and deception. will be appearing live on the Voice of America-Persian TV channel program entitled:Meezgerdee ba Shoma20(A Roundtable with You): East Coast time: 1:30 p.m-2:30 p.mWest Coast (LA & Vancouver) Time: 10:30-11:30 a.m.Tehran time: 10:00 p.m � 11:00 p.m. I am obliged to tell you that the Daily Telegraph article is far more vicious and venomous in its attacks against not only Cyrus the Great, but the legacy of the Iranian people and their history in world civilization. I ask that you please read and distribute this retort against the Daily Telegraph as widely and as quickly as possible. The irresponsible, irrational and unjust behavior of Islamic regime of Iran not only has brought about the worst problems and calamities to the Iranian people, but has also caused some other states and nations to believe that Iranians are a violent and adventurous people. It seems that this very notion is � both directly and indirectly - the root of ignoring Iranians� cultural and legal interests that, according to international laws, deserve to be protected by international institutions. One of the irresponsible actions of the Islamic regime is its ignoring the intentional plight of archeological sites and monuments that either belong to the pre-Islamic period of Iranian history or are related to religions other than Islam. Upon the provisions of Human Rights Charter and the 1972 Convention for preservation of national and world heritage, we - a group of people interested in the cultural heritage of the world - have gathered together in the International Committee to Save the Archeological Sites of the Pasargad Plains, and with the collaboration of numerous interested groups and societies both inside and outside of Iran, are endeavoring to salvage some of humanity�s cultural heritage. In several occasions we have written to Human Rights institutions, as well as the UNESCO, documenting our claims with pictures and reports prepared by specialists and experts, while explaining the ever-increasing pace of this destructive trend in Iran. 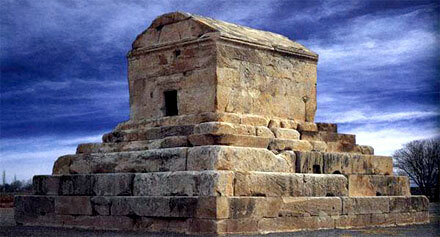 The most important endangered Iranian monument and site is the mausoleum of Cyrus the Great who, all through the history, has been considered as an important world political leader who championed the equality of people in the eye of the law and the prevalence of peace amongst the nations. He is the first one who, according to the accounts of the majority of the world archeologists and historians, declared and sanctified what we label today as Human Rights, 2500 years ago. The threat to his mausoleum comes from a dam � called Sivand � that has been constructed in the vicinity of this archeological site and is ruining it through elevating the humidity as well as the sub-terrain waters. Unfortunately, it is not only the Islamic regime that has ignored all the warnings and has actually intensified the operation of the dam. UNESCO has also chosen to be silent in the face of this imminent danger. The physical destruction of this monument has now been coincided with an orchestrated attack by the Islamic regime against Cyrus himself � an attack that is now being intensified by the articles written and published by two European periodicals. Although such biased articles have received due response from historians and experts, it is obvious that this two-tongued attacks are aiming the most revered and proud moment of Iranian pre-Islamic history that represents a rational and humane culture, far from atrocities of the ancient world and searching for world peace, harmony and co-existence of humans, regardless of their races or religious affiliations. We have now actually entered a critical phase, when the reports of experts and engineers, as well as the pictures taken from Cyrus�s resting place vividly manifest the immediacy and seriousness of the dangers foreseen since long time ago by all interested parties. We are seeking your help to salvage an ancient site that is registered by international authorities as a part of human heritage. We need the help of every one of you to put pressure on your local branches of UNESCO and other institutions responsible for the preservation of human heritage, asking them to act upon their assumed responsibilities and do not let political intentions hinder their efforts to stop yet another destruction of ancient treasures just like what Taliban of Afghanistan did to the Buddha�s statutes. Great response to morons who try to rewrite history to make a few bucks. How's your movie coming along Mr. Kar? What a fantastic article by Mr. Kar. Thank you so much for an eye opening and informative read. I guess certain individuals/interest groups/pseudo journalists will go to any length to discredit us on everything. I don't know which one is worst. The 2nd Arab invasion of our land or the recent campaign to erase our history by Zionists!? We should fight them both! Old testamente is nothing more than Shahnameh of Jewish people. The only difference between those books is that Ferdowsi did not say to be a prophet. "...In Persia first arises that light which shines itself and illuminates what is around... The principle of development begins with the history of Persia; this constitutes therefore the begining of history." That's Hagel talking, the Father of Western philosophy and Dr. Shulz' countryman. The idea of using government power and tax payer money for development and technology (agriculture, in this case) was a monumental step for humanity. "Those sentenced to death were buried up to their heads in sand,..."
"sand" is code word for everything Middle Eastern and Islamic. The landscape of even mountainous places like Afghanistan and Iran is imagined to be all sand in the mind's eyes of prejiduced Westerners. "The Orient" is a derogatory term from the 19th century basically meaning the un-civilized people of the East. It was believed at the time that "the Oriental" was incapable of deciding for himself and needed a European, an "occidental" to run his affairs; the argument for colonialism. Dr. Shulz' use in this instance is a mockery that anything good or "humane" could come from the Orient. All good things, by his definition, must come from the occident. I have and will again. Nobody else is going to teach the world about Cyrus. May the old flame never go out.Cyrus legacy is infinite, timeless & a beacon of light for the lost generations. The numnuts in Iraq accused, detained and ill-treated Cyrus Kar on now proven to be bogus charges of terrorism. He sure does a fine job on the revisionist pseudo-historians with nefarious agendas. Mr. Cyrus kar, thank you for this great article and information. PS: arabs just don't like the fact that the "two horned" character in the Quran is Cyrus, the Great Persian King. That should do to safeguard his reputation. Let the German scholar bark at the moon. Spiegel is turning to a History Tabloid! The guy is either an obsessive-compulsive towards attention or earning his living by selling historical and intellectual gossips. you have. Thanks for great and timely reply. This article is well constructed and I find it very enlightening as well. Cryus is our joy and pride. I long for the day to see your movie. Dear Mr. Kar, this was a great and very well informed article. It was a pleasure reading it. Thanks for your contribution. Your first name is very becoming of you. Do you see what this guy is doing? That is why we are who we are for generations and where we are today. Human being has dignity and no one on this earth is worthy enough for someone to denigrate his or her dignity for. A vicious cycle of self humiliation that goes on with no end in sight. Posted: Wed Aug 13, 2008 9:42 pm Post subject: "yellow journalism"
Yellow journalism, in short, is biased opinion masquerading as objective fact. Moreover, the practice of yellow journalism involved sensationalism, distorted stories, and misleading images for the sole purpose of boosting newspaper sales and exciting public opinion. It was particularly indicative of two papers founded and popularized in the late 19th century- The New York World, run by Joseph Pulitzer and The New York Journal, run by William Randolph Hearst. Cyrus the Great believed in one Supreme God, Ahuramazda (Wise Lord), the name coined by pre-Islamic Iranian Prophet Zarathushtra, more than 4000 years ago. Cyrus followed the teachings of Zarathushtra to be a good and wise ruler of all his subjects. Some western countries who want to attack Iran and its current Islamic regime are mounting a propaganda campaign to portray the great Iranian kings and people of ancient Iran as evil monsters to justify their goal of destroying Iran. People of all faiths should speak up against these lies and smear campaigns, especially Jews all over the world, whose ancestors were liberated by the good king Cyrus from slavery in Babylon, and who were promised money to rebuild their temple in their traditional homeland. I am fed up with such eurocentric prejudices. Der Spiegel & The Daily Telegraph should put their journalists' intellectual faculties, if any, to a better use. Since my primary school days, I was taught that the Western world is better than the Eastern World. I cannot bear this racist non-sense ANY MORE!